Made with 100% jute, our striking Classic Toy Bin features laurel wreaths and is ideal for storing toys in style. A tribute to needlepoint, the Cross Stitch Tin is a cabin favorite. The recycled tin is filled with 12 oz. of wholesome, crunchy Peanut Butter dog treats baked fresh in the USA. The whimsical woodland Squirrel Toy is made with durable backed tweed with two way squeakers for twice the fun. 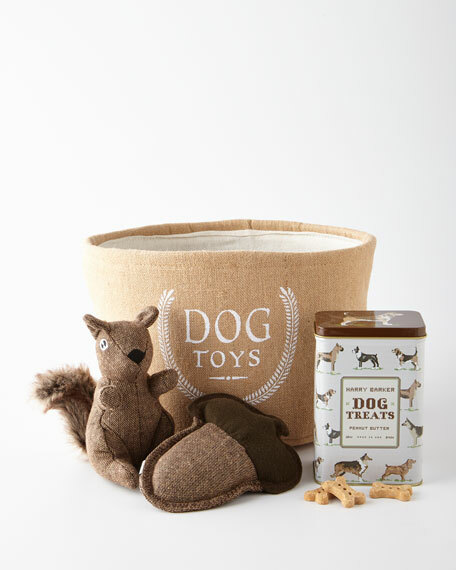 And pups will go nuts for our Tweed Acorn Plush Toy! Featuring double backed tweed canvas and eco-friendly stuffing, this toy is built for rough and tumble play. Fall gift set for dogs. Jute toy bin with laurel wreaths and "Dog Toys" printed on front. Recycled steel tin filled with peanut butter dog treats. Durable tweed squirrel and acorn toys. Eco friendly made with recycled materials and biscuits baked in USA. Toy bin: 12.75"Dia. x 8"T.
For in-store inquiries, use sku #2807513.